Melissa de la Cruz does it again: combining true stories and experiences with intricate editing techniques to create a terrific book. However, de la Cruz wasn’t the only writer in BECAUSE I WAS A GIRL. This book is actually a collection of true stories from all kinds of female entrepreneurs and celebrities who experienced similar struggles to de la Cruz. Many of the stories were different, because each woman had different cultural and educational backgrounds, careers and people who they were surrounded by. However, they all have a sound similarity: each woman was affected and treated differently because she was female. "Melissa de la Cruz does it again: combining true stories and experiences with intricate editing techniques to create a terrific book....This book is, realistically, for everyone." The book is organized by century, starting with the 1920s and going all the ways to the 2000s. Inside each century section, there are the individual women and their stories. The women are organized by when they were born (hence the century sectioning). As a result, the book follows in an almost chronological order because the women are put in chronological order by birth. The stories were surprising to me in this way because I expected a lot of the stories to be like those around them because they were based around the same period. But then I realized that they were expected to be very different because each woman had a unique perspective and life, almost as if they were living in contrasting times. The book was a lot of what I expected, along with a little bit more. 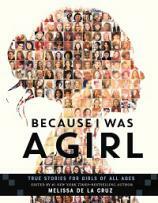 There were many stories for all types of girls, coming from all types of women and career paths. However, I did not expect to feel so personally touched by each of them. Whether it was with empowerment of being female, comfort in knowing that we share the same struggles, or pride in knowing that these women were able to make it to the top, to the career of their dreams, it was, without a doubt, interesting to hear about these people, with only a couple of pages for each narrative! I almost wish that there were fewer narratives so that the best ones could be longer, but then I would lose so much because every woman had something different to bring to the table. They were all captivating to listen to, and Melissa de la Cruz did a wonderful job of putting the whole thing together. This book is, realistically, for everyone. I can’t think of a type of reader, or even someone who doesn’t read often, who wouldn’t enjoy it. All you need to be to enjoy it is someone who can understand the influence of a female and the joy of reading such an empowering collection of stories.